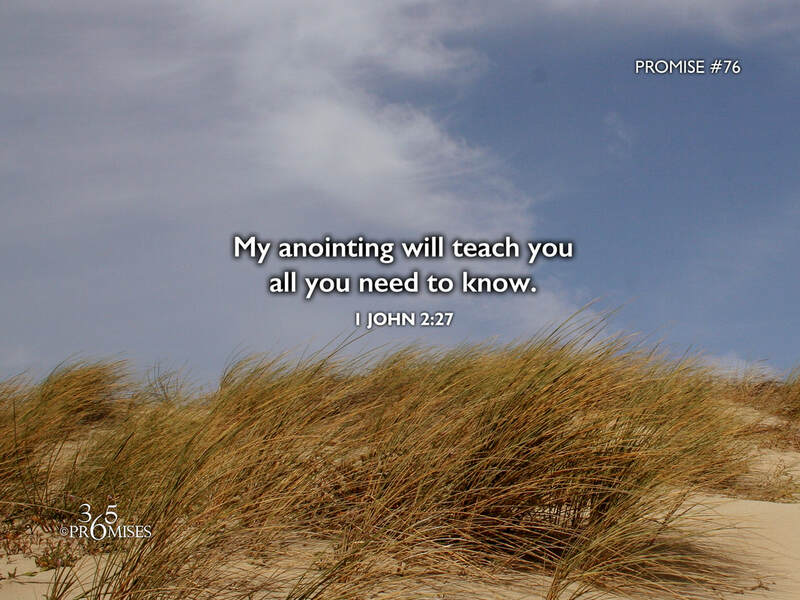 In today's promise, the Apostle John tells us that the anointing that comes from God abides in us and will teach us all the things that we need to know. The Greek word used for anointing in this passage is chrisma which is the root word for charisma or charismatic. The Enhanced Strong's Lexicon describes it as anything smeared on, unguent, ointment. This usually described the ceremony process when a priest was anointed as he was launched into public ministry. It is interesting to think that God has smeared us with His very presence so that we too can live our lives on earth as kings and priests (Revelation 1:6). This is an amazing truth...We are the temple of His Holy Spirit and the abiding place of God Almighty Himself! God has promised to lead us and guide us in all truth if we will simply have an ear to hear what the Spirit is saying. My prayer today is that you and I would be aware of the anointing that our God and Father has smeared on us that identifies us as His beloved sons and daughters. May each one of us have the confidence to know that we are not walking alone in this life, but the anointing will lead us and teach us everything we need to know.